It is often easy to miss the target if you don’t know what you are shooting at. This is how key environmental issues are often mismanaged. Today let me discuss issues that have been troubling me for the past many months. My provocation to write is the huge fuss (rightly so) about how Sri Sri Ravi Shankar, a respected spiritual guru, is constructing a mammoth structure, although so-called temporary, on the floodplain of the Yamuna. Environmentalists are up in arms, saying this will cause irreversible damage because the soil has been compacted, birds have disappeared and the floodplain has been destroyed. By the time you read this, the grandiose event is over and the National Green Tribunal, which is listening to the appeal, has decided to take a meek view of the situation—after much deliberation and an acceptance of the damage to the floodplain, it has imposed a small fine on the organisers and laid down conditions for remediation, which may or may not happen. Earlier, the same battle played out over the construction of a big temple and then a multi-storey residential complex built for the Commonwealth Games athletes. These were lost. More recently, it has raged over a bus depot called Millennium. In this case, a court—and the Delhi government—have ordered closure and the buses will now be parked in far-flung areas where land is available. This means there will be dead mileage. This when the cost of fuel is making public transport unviable. I would still argue that removal of this one symbol of bad planning will not save Delhi’s floodplain. Why do I say this? The brutal fact is that the floodplain is still not delineated in the land-use plan of the city. In the previous master plan of the city, the river zone area (called zone O) was identified as 9,700 hectares (ha), of which 1,600 ha is under water and the rest—a massive area of 8,100 ha—is considered to be mostly dry. However, over the years, a number of planned and unplanned developments have been undertaken in this zone, including massive residential areas with hundreds of thousands of inhabitants. It has, therefore, been agreed in principle that the zone should be planned and an acceptable land-use plan put in place. But this process is not complete and given the disagreements over what needs to be done on floodplains it will probably remain in a grey area. This suits many people. It allows for illegal takeover by land mafia till nothing is left. There is yet another problem. Why should a city that is so hungry for land keep over 8,100 ha of its prime area under an activity that nobody can really figure out? It is, therefore, important to understand both the recharge functions of a floodplain and its value as a flood-mitigation zone. This value can be realised only when the city sees the benefits it gets. This is why Delhi must link its flood zone management to its water supply. A proportion of drinking water must come from this zone. Delhi must also begin to use this zone for water storage, which, in turn, will help in managing pollution. It must be functional. Otherwise, all the hue and cry cannot prevent the floodplain from being gobbled up. It is also important that the plan for floodplain delineates the area through proper mapping on the ground and that this area is secured. This will mean taking tough decisions to leave out what is already gone in densely populated areas. This is always the most difficult of all tasks and nobody wants to bell the cat because accepting that a part of the land has been lost means accepting illegal encroachments have happened. This is something bureaucrats are loath to do. And public activists make their task easier by screaming foul. Status quo remains. The land mafia celebrates. It also means preparing a plan of what is acceptable use. It cannot be do nothing. It means setting aside land for the river, for ecology, for parks and even identifying land which can be used for public utilities that are nondestructive like a bus depot. It will mean that functions that are clearly a travesty of ecological use, like the Art of Living function, will not be allowed. But taking this call is even tougher because the credibility of public institutions is low. So, such a plan will not be made. Instead, now that the floodplain has been cleared and a huge installation allowed, it is now going to be viewed as real estate. 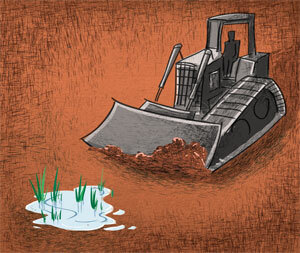 The permissible land-use, which is recreational, could be easily misused. In this place a giant mall or something similar can be built. It will be the death of the floodplain, one way or another. So, it is time we chose the right target. This one we must not miss. A very disappointing write up from Ms Sunita Narain. The CSE's enthusiasm and spirit in hitting multinationals on their perceived wrong doings is missing when the writer comes across AOL and a spiritual Guru. It is just winking at AOL rather than making any attempt to put AOL on the mat for its wrong doings as majority of the public feel. CSE is known for its fearless criticism of anyone who goes against the environment But when faced with the spiritual Guru, the resentment from CSE is just a whimper and not the usual thunder. The success of Bharat Mata's Mahan Gurus, lies in such lukewarm resentment from reputed people while they go on doing wrong things in connivance with the establishment as the Kingfisher boss has done.